marks the beginning of the Paleozoic Era. This period gets its name from a place in Wales where the first examples of this type of ancient life was found. The period lasted for nearly 53 million years, from about 543 million years ago until 490 million years ago. The climate at the beginning of this period was cold, but over time the climate in all parts of the Earth grew warmer. This made the seas a good place for many species to live. The continents were still forming. They were mostly barren rocks. The land had no plant or animal life on it yet. During the Cambrian Period there was an explosion of life forms. Most of these were in the water. Many animals with no backbones lived in the shallow seas. These animals were invertebrates. arthropod with a tough outer skin. It got its name from the three lobes in the hard skin. The trilobite was also one of the first animals to have eyesight. During the Cambrian there were more than 100 types of trilobites. There were plenty of other species living during the Cambrian Period also. 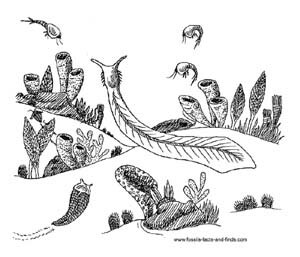 Mollusks, worms, sponges and echinoderms filled the Cambrian seas. There was even an early type of chordate living during the Cambrian Period. It was the Pikaia. Pikaia looked a bit like a worm with a long fin on each side of its body. The nerve cord was visible as a ridge starting behind the head area and extending almost to the tip of the body. One of the most fearsome hunters in the Cambrian seas was the Anomalocaris. This animal had an exoskeleton like an arthropod, but it did not have the jointed legs that would make it a true arthropod. This large animal fed on trilobites and other arthropods, worms and mollusks. Sponges grew in Cambrian seas, too. These animals belong to the phylum porifera because of all the tiny pores in their bodies. One species of sponge from this period had many branches that made it look like a tree. Another type of sponge looked like an ice cream cone-without the ice cream, of course! Many of the sponges became extinct when temperatures dropped at the end of the Cambrian period. Many of the creatures living in the Cambrian seas developed hard structures for defense, hard shells, scales, and spikes covering the outside of the body. 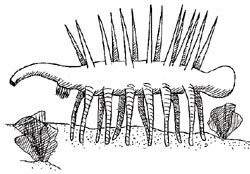 The Wiwaxia lived on the bottom of the sea. 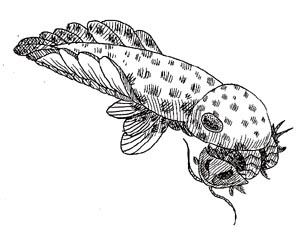 The dorsal side of its body had scales and spikes for protection. The underside of Wiwaxia was soft and unprotected. 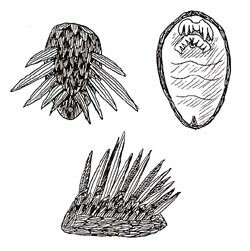 Trilobites also living on the bottom could burrow under the Wiwaxia and attack the defenseless belly. Hallucigenia stood on seven pairs of tall legs. Its long, tube-shaped body had two rows of tall spikes along its back. This type of protection would have been very important for the animal because it had no eyesight to warn it of dangers. The plants of the Cambrian were mostly simple, one-celled algae. The single cells often grew together to form large colonies. The colonies looked like one large plant. The Cambrian Period began with an explosion of life forms. It ended in a mass extinction. Advancing glaciers would have lowered the temperature of the shallow seas where so many species lived. Changes in the temperature and the amount of oxygen in the water would have meant the end for any species that could not adapt. What came before the Cambrian Period?